We are looking for a visual artist to take up an exciting opportunity in Lochaber. 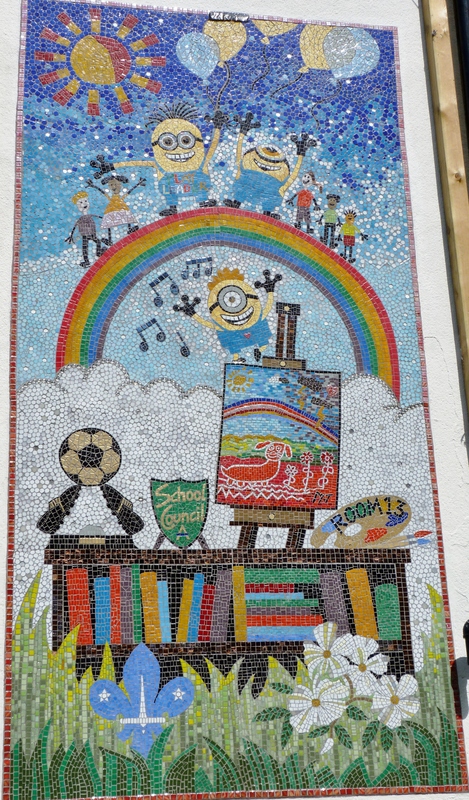 We have a nine month contract to offer an artist who will work with us to develop and deliver a series of workshops and creative engagements with community groups and local schools, including Lochaber High School. This work is part of Room 13’s delivery as a partner in the Highland Youth Arts Hub and the contract will be awarded to someone who is socially engaged, self motivated and who, ideally, has some experience of delivering innovative projects and working with the wider community, specifically young people. The Highland Youth Arts Hub (HYAH) promotes cross-art-form working. Applications are welcome from artists who are comfortable working with a range of media, including digital software, photography, music and creative writing. Work with pupils and staff across different departments at Lochaber High School to promote engagement with, and understanding of, contemporary arts practice. Identify, enthuse, mentor and involve a core of young people as collaborators in visual art projects. 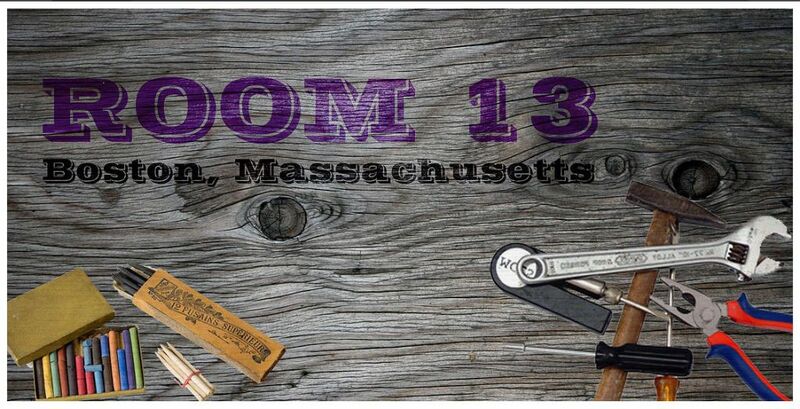 Develop and deliver a series of workshops with community groups keen to work with Room 13. Develop own practice through using studio and gallery space available. Room 13 are one of twelve partner organisations that make up the Highland Youth Arts Hub (HYAH). The Highland Youth Arts Hub is one of nine such groups that have been set up across Scotland to deliver the National Youth Arts Strategy; ‘Time to Shine’, supported by Creative Scotland. This opportunity includes the offer of accommodation, and the selected artist will be supported by the wider Room 13 International team based in Lochaber. Download the full brief here for more information on this opportunity and details on how to apply. Lead artist and facilitator Amy Raymond has been working with staff and students to establish a new Room 13 studio in Excel High School, South Boston, MA, USA. The team are currently working on a campaign of awareness and fundraising ahead of opening their studio in the fall. 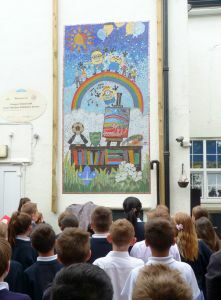 Visit their website to find out more about their school, and their aspirations for the project. Support them by donating a tool or contributing to their crowdfunding campaign! We are pleased to share news of 2 new Room 13 studio start-ups in the Republic of Ireland, supported by Fingal County Council Arts Office. Room 13~Scoil BhrídeCailíníNational School and Room 13~Tyrrelstown Educate Together National School in Dublin 15 are the first Room 13 studios to open in the Republic of Ireland. The studio doors were opened for the first time with great excitement in November 2014 with artists Orla Kelly and Anne Cradden. 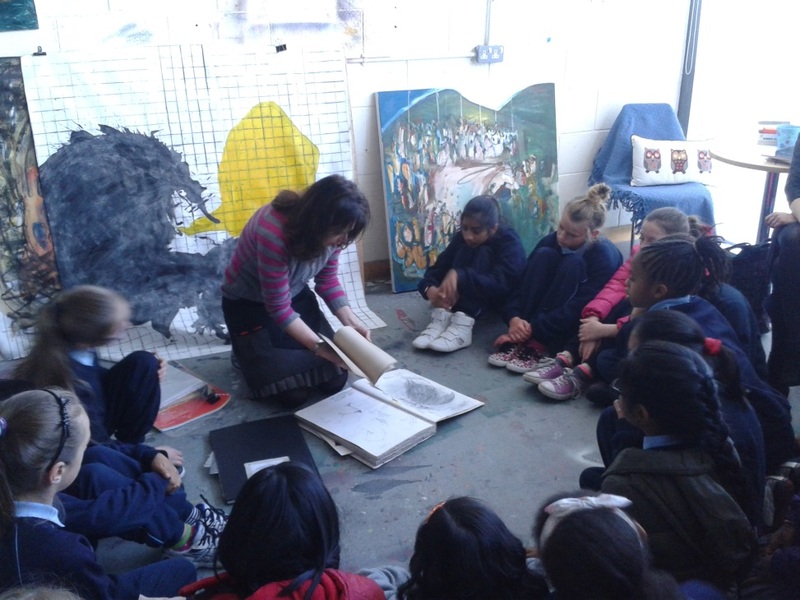 Each artist is working as artist-in-residence in their respective schools, invited by the students,schools and Fingal Arts Office. By now, both studios are evolving organically and are informed by the students’ line of inquiry. The studios are open five days a week and currently have ages 6-12 sharing the facilities. 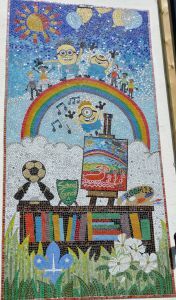 However the 10-12 year age group are lead protagonists, taking responsibility for directing the studios’ evolution. The studios are in the early stages of development, but they have made a commendable difference in the lives of many already. The students are very proud of their art studios and would choose to work there all day given the choice! ‘I am a contemporary artist working presently with painting and drawing. On a regular day I can have about 20 drop in visitors to my shared studio space in Scoil Bhríde Cailíní to see what I am working on, to chat about art, materials, constructing and engineering, or just to give a hug. It’s not a regular studio environment, as the average age of those I share with are 8-11 years old but it is a perfectly dynamic and rich one, offering daily crits, posing meaningful aesthetic challenges, providing an enthusiastic and vocal audience for developing work. ‘The children are more than capable of generating their own ideas in the studio; our role as the involved adults is to build the capacity of the children to explore, invent, experiment and realise their ideas. The studio is a hub of creative activity, where amazing conversations and creative exchange takes place on a daily basis. The senior students (5th&6th) are gaining an understanding in to my work in Fingal Arts Office and the important role played by organisations and individuals providing contexts within which art can be made, shared and received. For some students this is an exciting element of the studio programme, and for others the art making is more exciting. Wherever their interest lies, there is an important role for everyone who wants to be involved’. 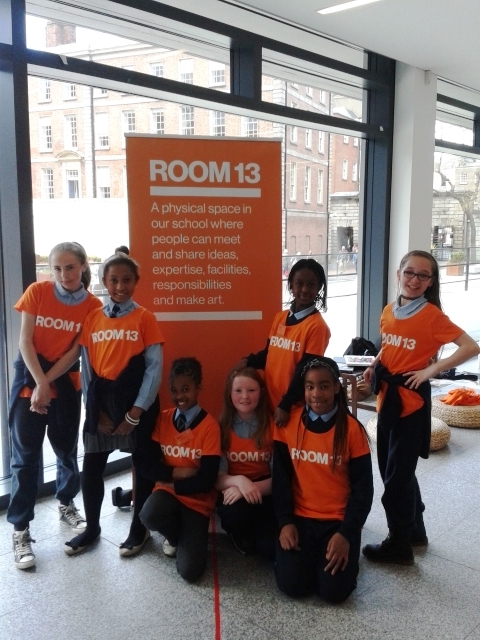 Room 13 ~ Fingal is proudly supported by Fingal County Council Arts Office. Room 13 International has teamed up with Bright Productions to stage two exciting public events this summer, each leading to the creation of an intriguing temporary artwork in an urban setting. Members of the public, young and old, will be invited to collaborate with lead artist Richard Bracken to construct ‘the best den ever’ while storytellers and performers will be on hand to capture public reaction to this activity, gathering stories and memories of mud and mischief, weaving new tall tales and generating much laughter and a few surprises along the way! These events have been devised in response to a brief from Highland Play Improvement Group, aimed at engaging people in play and exploring the benefits of play, while challenging people’s views on play in public places. The first event will take place in Cameron Square, Fort William, on Saturday 4th July 2015, 11am – 3pm. 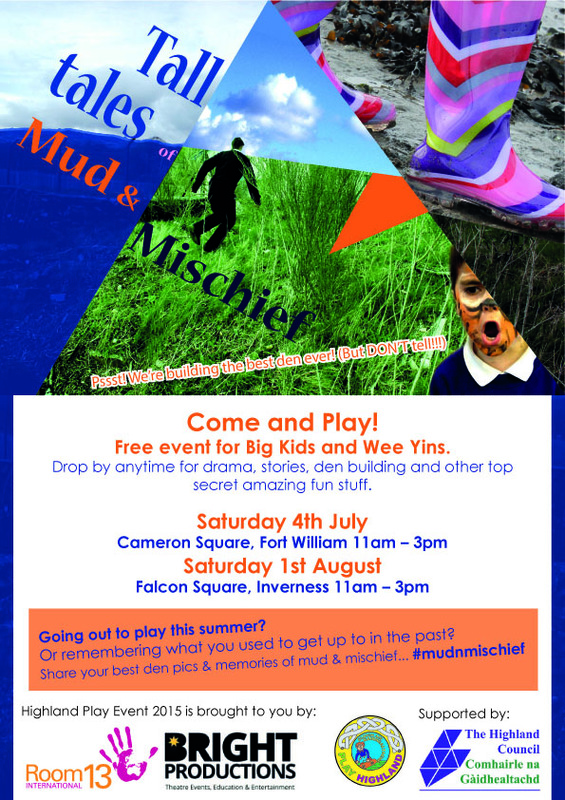 This will mark the start of a campaign to promote and encourage den building and unstructured play activities in communities Highland-wide throughout the summer, culminating with a principle event in Falcon Square, Inverness on Saturday 1st August. Children and adults alike can participate all summer long by posting photos of their own den building exploits or sharing their childhood memories of mud and mischief to the online campaign using the tag #mudnmischief. Room 13 International is being supported by Highland Council to deliver these events. Our key collaborators include Bright Productions (delivering theatre events, education and entertainment Highland-wide) and community partners such as Nevis Radio (a community radio station based in Fort William, broadcasting to the surrounding region of Lochaber and all parts of the Western Highlands), Dramafish Studios and Youth Highland who will help promote the campaign and gather stories of Mud & Mischief via social media and other local channels.